Extended magazines increase a handgun’s ammo capacity. While that sounds like a no-brainer, many factors, such as the size of the magazine can be a concern for Glock owners who practice concealed carry. With a range of designs, carrying capacity, and sizes, finding the right product can be a hassle. This article will go over the basics of extended mags, whether they’re worth it, how to find the best one for you, and then a breakdown of the top products on the market. Whether you’re looking for something that will still be concealable or a magazine that greatly extends your capacity, read on! Are Extended Magazines Worth the Hassle? Extended magazines have a reputation for being bulkier, heavier, and harder to conceal. While that’s inherently true, how much extra heft and space the extended magazine takes up is going to depend greatly on the actual product itself. Some extended magazines add a single extra round and use up very little relative space. You should note that the quality of the product is a big determining factor. Buying a cheap product that isn’t designed to minimize space consumption will leave you with a lot of extra bulk that truly may not be worth it. For this reason, we recommend reading our reviews, as the products we examine are high-quality and mitigate these concerns. With a proper extended magazine, it’s possible to add extra rounds for when you need it most. In a self-defense situation, extra rounds can fast become a life-or-death factor. Plus, there’s nothing stopping you from keeping an extended mag or standard mag on hand, with the opposite loaded in your Glock. ​Do you want to add two rounds, or just one? Whether for self-defense or sport, varying capacities can be appealing. Do you want to shoot more and reload less with a larger extended magazine, or just want an extra round for self-defense? ​Extended magazines need to be at least as reliable as a regular magazine. There’s no point in having extra rounds if they misfire. ​It will be harder to conceal a larger magazine than a smaller one, and although capacity is directly tied to size, the design of the magazine is unique. This means one that holds an extra four rounds might be larger or smaller than another brand’s extended mag that holds an extra four bullets. 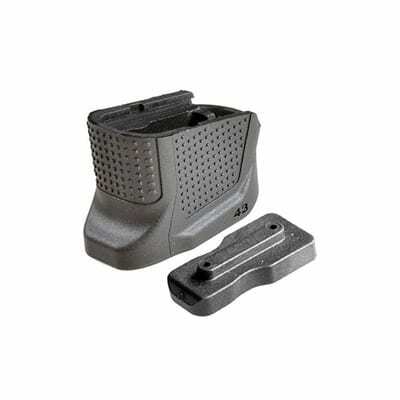 ​An extended magazine can be compactly designed and still add heft simply by virtue of adding extra rounds. If weight matters to you, keep in mind that the weight of the magazine unloaded won’t give you a complete picture—a loaded weight will. ​While what you value will change depending on your needs, it’s important to remember what you’re getting should be reasonably priced. Thankfully, most extended magazines that add one or two rounds and are designed for concealed carry are priced similarly to standard magazines. That said, before you shell out your hard-earned cash, make sure you’re paying for what you want and need. 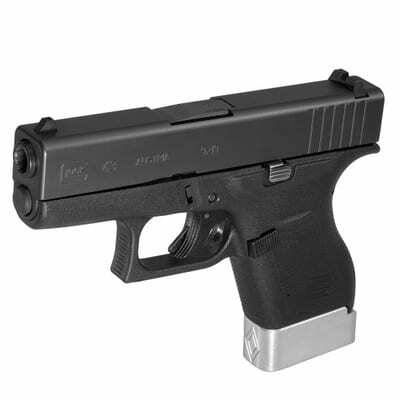 Below are the best magazine extenders on the market for Glock 43. All are designed to offer one or two additional rounds, and all are affordable and provide a greater level of concealment than products not on our list. That said, each offers a unique design, concealability, and of course, price tag. You’ll get different levels of durability, too, so keep your habits in mind and read on for the best magazine extensions—one of which will soon be yours! The Pearce Grip Extension for Glock does as its name suggests and provides a superior grip out of the box with extra surface area, albeit matches the factory texture. While this is a great bonus, we’re primarily here for extra rounds and concealment. Happily, the Pearce Grip Extension adds very little extra volume, in part because it adds only a single extra round, and it does this by replacing the magazine floor plate. In fact, the extra 3/4-inch gripping surface is more noticeable than the extra mass, even though the added round tacks on 0.82 inches in length. Additionally, the slight extra length functionally acts as a pinky extension. In terms of concealability, adding less than an inch is going to have a very minimal effect. On the other hand, you’re only getting one additional round. Now, that round might be a life and death determination, but understand that one round is what you’re getting. Priced comparatively to a standard magazine, if you’re on the fence about extended mags, it really just makes sense to go with an extra round for so little added extra length. Concealment remains virtually the same, you get a better grip, and you get one more shot, all for about the same price as a regular magazine. Lastly, you don’t need a new spring or follower. 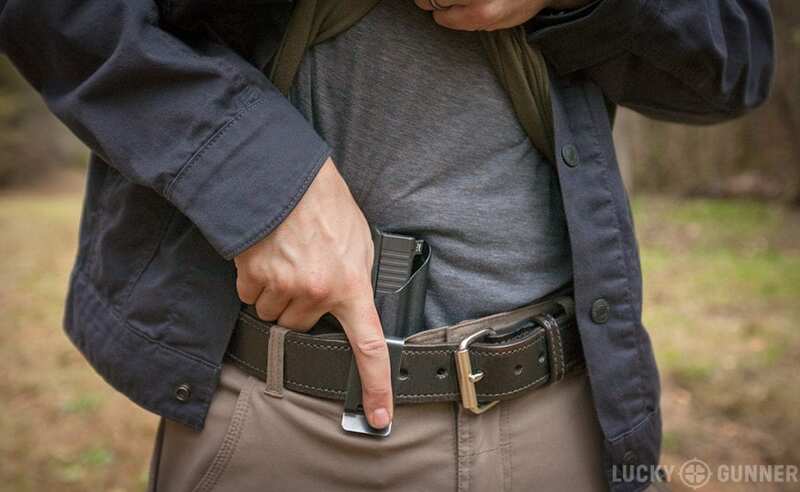 Pearce Grips are very popular and it’s easy to see why, as there’s next to nothing to lose and everything to gain—unless, of course, you want more than a single added round. For those who are fine with a standard magazine, the Pearce Grip Extension For Glock makes perfect sense, offering many great additions alongside an extra round, for about the price of a standard magazine. If the Pearce Grip For Glock strikes your fancy, but you’d like more than a single round, Strike Industries has you covered. With two extra rounds, the Enhanced Magazine Plate For Glock 43 +2 adds two extra rounds for a more substantial extender, bringing your capacity up to nine rounds on a Glock 43. You’ll also enjoy a low drag and no-snag design for improved reloading. Like the Pearce Grip, you’ll also get more finger space. As it adds more space, Strike Industries also took the opportunity to make it more ergonomic, which not only makes the grip more comfortable but also allows for a better hold and thus, superior accuracy. Even though it adds an extra two rounds, you can continue to use the same spring and follower, requiring no additional purchase. Overall, it adds little extra size and heft to your Glock, at just under an inch and a half added length. If you want something more substantial than a single round, having nine rounds is a distinct advantage without too much of a hassle. To bring your round count up to nine, the Strike Industries Enhanced Magazine Plate For Glock 43 +2 does this and more, improving ergonomics and ultimately, accuracy without much additional volume. 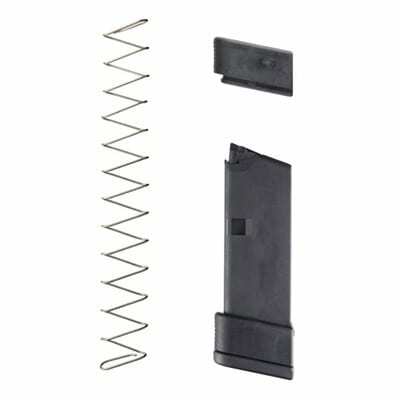 The Tangodown Magazine Extension For Glock 43 adds some thoughtful design to the process of adding rounds to your Glock. You’ll get two extra rounds, bringing your total round count up to nine. It is injection molded from the same material that’s used in the magazine’s body, with an extended floorplate designed to fit a comfortable firing grip. What we really like is that rather than using the same spring and follower as is standard, TangoDown provides an improved set. To be clear, we prefer either using the standard set or including an improved set, and some extenders will require a new set to be purchased separately. Here, Tangodown’s spring is longer, heat-treated, and made of stainless steel. Not only will it last longer, but it feeds very smoothly and comes with a last-round slide lock back. Compared to the offering from Strike Industries, we have to point out that both products add less than an inch and a half. Tangodown provides an improved spring and is a better value. However, it does not improve ergonomics as well as the Strike Industries extender. If you’re looking for a great budget extender and don’t care about ergonomics as much, this is your magazine extender. 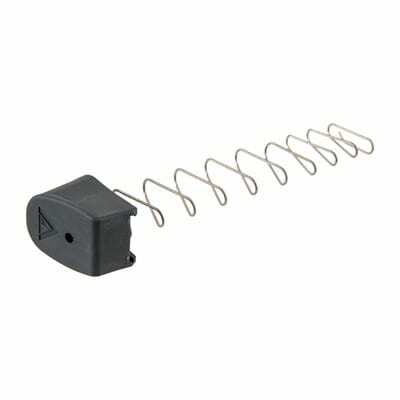 An excellent value for those on a budget, Tangodown’s magazine extender runs lower than even some standard magazines out there and includes an improved spring, all while adding on two extra rounds to your Glock 43. A great value! If you’re looking for the most budget-oriented solution on our list, here it is: the Ghost Glock 43 Magazine Extension will add two rounds to your Glock while keeping your bank account virtually untouched. It leaves your Glock virtually untouched too, living up to the Ghost name by being virtually transparent. By using the same existing magazine base plate, you’ll notice very little change overall in your grip, except that it’s now elongated by about an inch and a half to provide extra room for your pinky and thus, better grip. Now, you don’t get particularly improved ergonomics or grip surface here, but there are some extras. First, you get a stainless-steel magazine spring, which does show some minor improvement over the stock spring. Don’t expect too much, but you should see some smoother feeding. What truly makes us happy is the lifetime guarantee. Not one or two years, but a lifetime unlimited guarantee on a budget magazine extender. Ghost could have very reasonably offered no warranty for the great value they’re providing, but they gave it to you anyway. While certainly not the best all-around magazine extension on our list, you can’t beat the value, and a lifetime guarantee to back it up truly makes this a must-have for budget-conscious shoppers. For shoppers who really want to add two extra rounds to their Glock 43 but are dubious about price, the Ghost Glock 43 Magazine Extension provides incredible value and a lifetime guarantee. 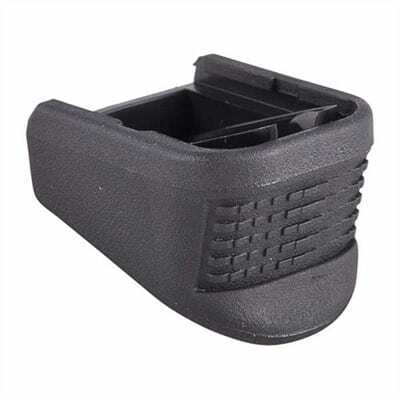 For shoppers looking for a quality magazine extender and willing to spend a little extra, the Taran Tactical Innovations Firepower Base Pad For Glock 43 is a must-have. Additionally, it comes in two flavors: a +1 or a +2, adding one or two rounds respectively. No need to decide on which product to get, as you’ll get the same great design either way. You’ll notice the quality right away, as the one-piece design requires no tools or devices to disassemble and there are no little parts to lose. It has excellent durability and is lightweight, made from CNC machined billet aluminum and is also hard anodized. This monster will withstand the test of time without feeling like the beast it is. Here’s the best part: the +1 model adds absolutely no extra length. That’s right, the intelligent design behind this magazine ensures a compact, but efficient feeding structure that keeps your concealed carry just as hidden as with a standard magazine. The +2 adds a little over 3/4 of an inch, making both incredibly concealable. The +2 version comes with a stronger spring made from stainless steel, whereas the +1 uses your stock factory spring. Lastly, Taran Tactical Innovation components are all made in the USA and pass through rigorous quality control inspections. Ultimately, if you want to add to your magazines but want to sacrifice neither quality nor space, this is the way to go. It’s a little pricier, but it’s certainly worth it. 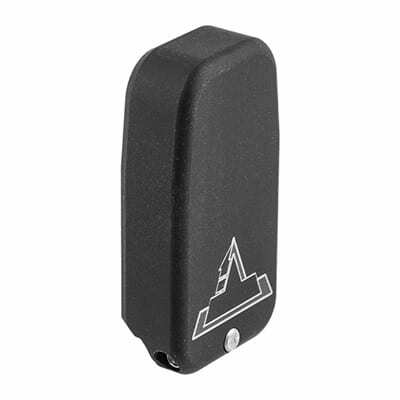 If you want the absolute best magazine extender for the Glock 43 in terms of concealability and budget is not a concern, it would be hard to beat the nearly invisible and tank-like design of the Firepower Base Pad. We’ve taken a look at whether a magazine extender is worth it (it is) and what you should consider before making a purchase. Your needs will always come first, so armed with that knowledge, choose the one that makes sense for you from our list. We’re happy to say that all will provide an extra round or two, without ruining your ability to conceal properly, but some might make more sense for your tastes than others and might even improve performance. Either way, grab a magazine extender for your Glock 43 and conceal your handgun knowing you’ve got an extra chance or two!